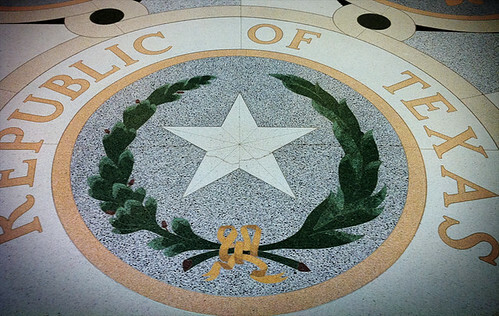 Happy 175th Independence Day, Texas! 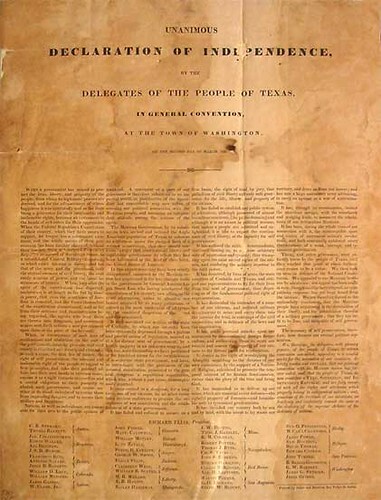 On this day 175 years ago, whilst the Alamo was under siege by Santa Anna’s army of Mexico, a group of men representing the settlements from around Texas convened at a little village called Washington on the Brazos to declare Texas’ independence as a nation and produced this document. I have always loved Texas. I was born in the South Plains where artifacts of the first Texans (e.g., spear points of prehistoric weapons) were discovered and centuries later the West’s most feared group, the Comanche, roamed free hunting innumerable buffalo on the Llano Estacado. The four-post, canopied, solid mahogany bed I slept in growing up belonged to the estate of the Father of Texas, Stephen F. Austin (it is now my eldest son’s bed). My summers were spent in the Hill Country running across land that Indian, Spanish, Mexican, Tejano and Anglos of history past have likely put under foot (there are Indian mounds still today). In Central Texas, I attended the oldest university in Texas which, at its founding in 1845, was done when Texas was still a nation unto itself. Sam Houston’s children attended Baylor. Houston himself made his personal library available to Baylor students. I currently live in the Gulf Coast, only a short distance from the battlefield of San Jacinto, where Texas won her freedom, even shorter distance from where Cabeza de Vaca, the first European ever set foot on Texas soil, landed in Galveston in 1528. Needless to say, Texas runs in my blood…and in my family’s. Just a couple weeks ago we took a trip to the state capitol to educate our children on the history of their great state. We couldn’t get enough of it! My current read is literally a textbook on Texas history that was recommended to me from a gracious history professor at my alma mater. Texans, what inspires you about ‘The Great Nation’?